The UK has made excellent progress on reducing emissions. But the hard part is yet to come. The UK’s Climate Change Act (2008) established a legally binding obligation to reduce UK emissions by at least 80% from 1990 levels by 2050. This is an ambitious undertaking, a sixty year programme to cut four in every five tonnes of greenhouse gas emissions while simultaneously growing the economy. The story so far is, broadly, an encouraging one. 2016 emission were 42% below 1990 levels, about half way to the 2050 target. This has been achieved in 26 years, a little under half the time available. And it has been achieved while population has grown by about 15% and the economy has grown by over 60%. 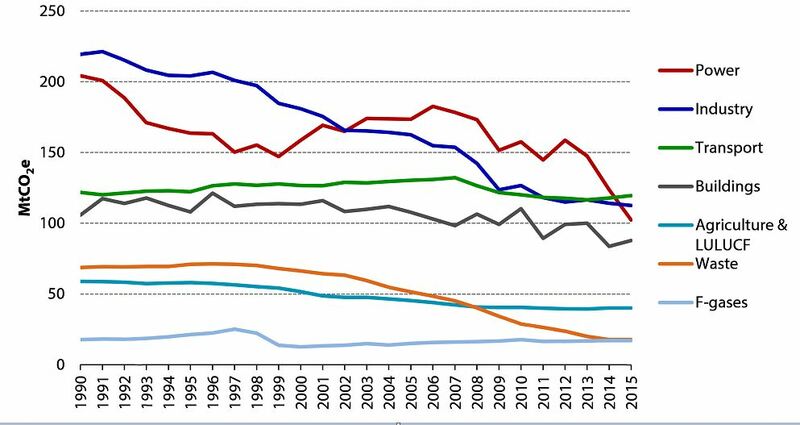 The reduction in emissions from 1990 to 2015 is shown on the chart below, which also shows the UK’s legislated carbon budgets. There is of course some uncertainty in the data, especially for non-CO2 gases, but uncertainties in trends are less than the uncertainty in the absolute levels, and emissions of CO2 from energy, which is the largest component of the total, are closely tracked. The chart below shows the sectoral breakdown of how this has been achieved, and this raises some important caveats. The largest source of gains has been the power sector, especially if a further fall of a remarkable in emissions from power generation in 2016 is included (the chart only shows data to 2015). While renewables have made an important contribution, much of this fall has been due to replacing coal with gas. This been an economically efficient, low cost way of reducing emissions to date, to which UK carbon price support has been a major contributor. However coal generation has now fallen to very low levels, so further progress requires replacing gas with low carbon generation – renewables, nuclear and CCS. This is more challenging, and in some cases is likely to prove more expensive. The next largest source of gains, roughly a third of the total reduction, is from industry. However, while detailed data is not available, a large part of this reduction may have been due to broader economic trends, notably globalisation of the world economy leading to heavy industry becoming more concentrated in emerging economies. This trend may also have had some effect on electricity demand and thus emissions. 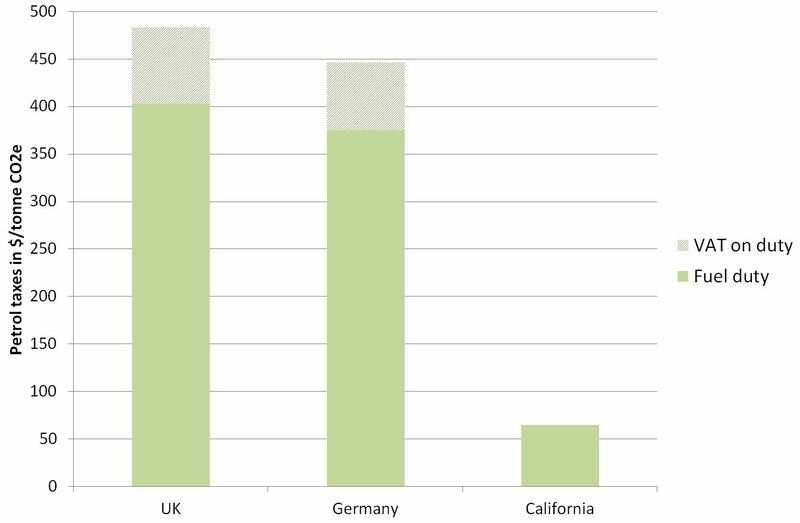 The aggregate reduction in global emissions may thus be smaller than indicated by looking at the UK alone. Reducing global emissions still requires a great deal more progress on industrial emissions, especially in emissions intensive sectors notably iron and steel and cement. Progress in reduction of emissions from waste, especially methane from landfill, has been a third important contributor. Again, this has been highly cost-effective reduction. However about two thirds of emissions have now been eliminated so further measures will necessarily make a smaller contribution, though there is much that can still be done with the remainder such as eliminating organic waste from landfill. Other sectors have done much less, and will need to do more in the years to come. Progress on f-gases may be helped by the recent international agreement on HFCs, although more will still need to be done. Transport emissions have made only slow progress in recent years. It is essential that electrification is encouraged so that a large change similar to that achieved in the power sector can be achieved in transport. The buildings stock remains an intractable problem, and the first priority must be to at least make sure that new buildings are built to the highest standards of insulation. 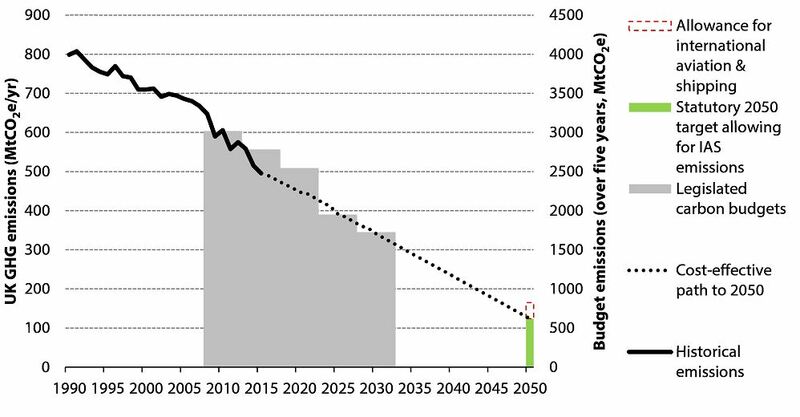 So continuing the trend of falling emissions in future will be difficult and will require new and enhanced policy measures. But in 1990 the prospects of achieving what has already been achieved doubtless looked daunting, and progress to date should encourage further efforts in future. Material in this post draws on a presentation by Owen Bellamy of the Committee on Climate Change at a British Institute of Energy Economics seminar on 5th April 2017. 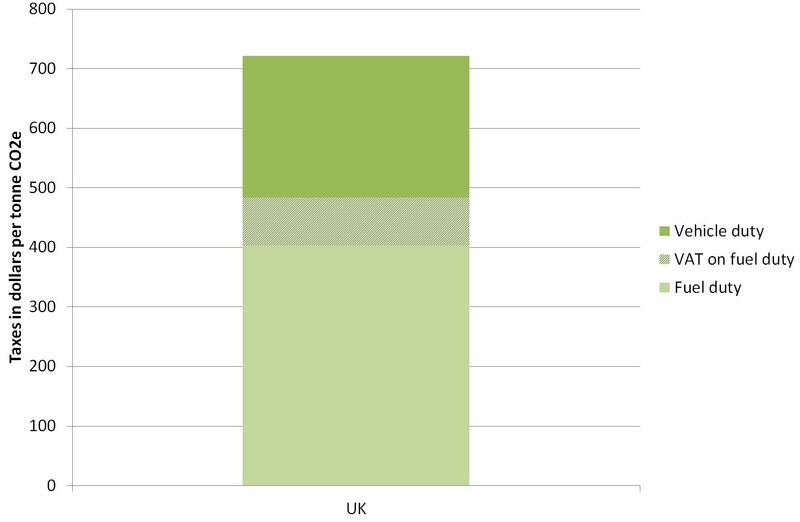 The UK’s domestic emissions need to go down slightly more rapidly than the headline target would suggest due to the role of international aviation and shipping. This is shown on the chart. However the broad message is the same. This entry was posted in carbon pricing, carbon taxes, Climate change policy, electric vehicles, energy efficiency, transport and tagged climate change policy, energy efficiency, energy technology, power generation, renewables on 25/04/2017 by adamwhitmore. How fast could the market for electric vehicles grow? 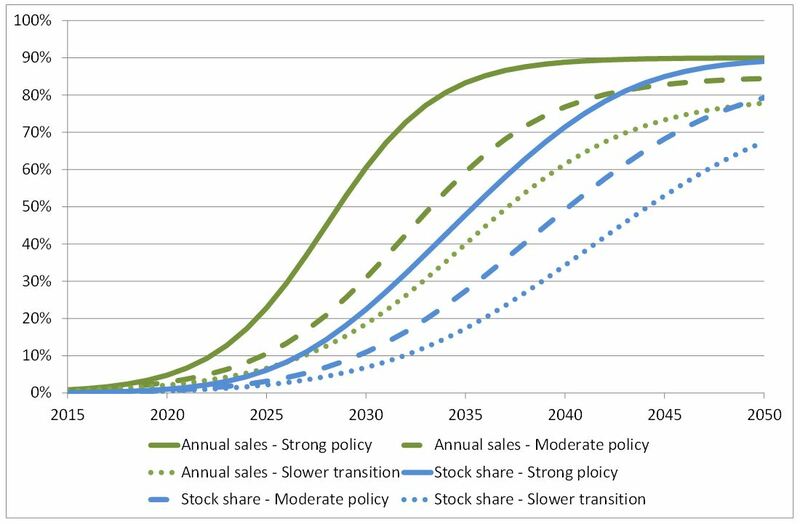 Various policy driven scenarios show electric vehicles gaining market share over the next few decades but with the turnover of the vehicle stock taking longer. I recently argued that BP’s projections showing almost no take-up of plug-in vehicles by 2035 was unrealistic in view of several convergent trends. There is increasing pressure to reduce CO2 emissions, there is large and growing concern about urban air quality, and electric vehicles are likely to prove attractive to consumers in many respects. In line with these drivers, sales are growing very quickly and many new models are coming on line, while battery technology is improving rapidly, with costs falling sharply and energy density rising. However while these factors suggest that electric vehicles will gain substantial market share it does not say how much how soon. So how fast might the market for plug-in vehicles grow if policy drivers are strong and matched by favourable economics? Here I consider how quickly electric vehicles could gain market share on that sort of optimistic view. The transition to electric vehicles is in its early stages, so extrapolating historical trends offers only limited guidance. Similarly, highly detailed modelling may not offer robust insights, because too many assumptions are required. Instead it seems appropriate to look at some broad indicators. A good starting point is to look at adoption other new technologies. The chart below shows the rates of penetration of new technologies in the USA over the 20th and early 21st centuries. It shows variants on a characteristic s-curve shape, with most technologies reaching eventual penetrations of 80-100%. The typical time to reach about 80% penetration following the first 1% or so of deployment (about where plug-in vehicles are now) is around 20-30 years, although some modern highly scalable technologies have become nearly ubiquitous faster than this, and other technologies have taken as long as fifty years or so to reach high penetration. World War, before growing steadily again through the to the second half of the 20th Century. However these timings are for the USA, and, even in increasingly homogenous, world global adoption may take a little longer. The chart mainly shows technologies that fulfil a new function, rather than those that replace existing technologies, as plug-in vehicles do. However replacement technologies can also gain market share quickly. Digital cameras replacing film almost completely over a period of around 15-20 years, and DVDs replaced VHS in less than 10 years. In these cases the new technology brought clear advantages. For plug in vehicles a combination of some advantages plus regulatory drivers could play a similar role. EVs are rather different from many of these cases in that there is a large existing capital stock which is expensive to replace – a new car is much more costly than a new camera. This limits the rate of change of the stock. I have therefore applied the sorts of timescales shown above to a rough and ready model representing the potential rate of gain market share of new vehicles, rather than changes to the stock. The model uses a standard s-curve (logistic function). Changes in the stock are then calculated considering stock turnover. I have developed three scenarios representing respectively strong policy drivers, more moderate policy drivers, and a delayed transition representing either weaker policy or greater practical or economic obstacles. The strong policy case fits better with the historic data, but this may not be a reliable marker as the history is so short and there are a number of particular circumstances at work. I have assumed plug-in vehicles will eventually account for 80%-90% of the market for light vehicles, with markets for internal combustion vehicles likely to remain where consumers seek low capital costs or they need long range with poor infrastructure. There will doubtless also be small niches for car enthusiasts seeking experience of the internal combustion engine, just as there are for taking photographs on film. However these are likely to play only a small role. The rate at which the stock of vehicles is replaced depends on how long vehicles last. I have assumed this to be 15 years, although there is obviously a distribution around this. If this were to lengthen further it would slow the change in the stock, or could be shortened by incentives to scrap older vehicles. The life of new electric vehicles is unproven (although battery guarantees of typically around 8 years are available), but in any case I have assumed buyers replace their battery packs, or replace their EVs with other EVs rather than returning to internal combustion engines. Growth of the vehicle fleet leads to a faster proportional changeover of the stock, assuming plug in vehicles gain the same share of the larger market, because current sales are a greater proportion of the historic stock. I’ve here assumed a 2.5% p.a. global growth rate for car sales. The results of this analysis are shown in the chart. Annual sales of EVs reach 20-60% of the market by 2030, expected to be over 100 million vehicles p.a. by then. They by then account for around 7-22% of the vehicle stock, or around 100-330 million vehicles. By 2050 electric vehicles account for a majority of light vehicles on the roads in all the scenarios. So do these projections make sense, and what might stop them? Cost competitiveness. Analysis by a variety of commentators show EVs becoming economically competitive in the early to mid-2020s, varying between geographies depending on factors such as driving patterns and petrol prices. This timing corresponds with the period when vehicles begin to gain market share much more rapidly in the above model, especially in the first two cases, which appears consistent. China. A large proportion of vehicle sales in the coming years will be in developing countries, especially China. Concerns around urban air quality, development of the indigenous automotive industry, infrastructure development, and oil imports look likely to tend to favour EVs in China. Driving patterns based around lots of shorter distance urban driving are also compatible with EVs. For these reasons government policy in China strongly favours EVs. Again this seems consistent. Growth rate. The compound annual growth rate for annual sales over the period to 2030 ranges from 25% to 33%, both well below current growth rates of around 60% p.a. Scale-up. The need to produce tens of millions of additional EVs by 2030 is a formidable challenge. However the international car industry increased production by about 35 million units p.a. over the two decades between the 1990s and 2015, and added 20 million units p.a. in the last decade alone. Replacing models with electric equivalents at this scale does not seem like an insuperable barrier, at least in the lower two scenarios. However the challenges of achieving this for the stronger policy scenario are formidable, and policy drivers would need to be correspondingly strong to overcome these barriers. Battery production would also need to be scaled up by orders of magnitude. There don’t appear to be any fundamental barriers to supply of the vast quantities of lithium that would be needed, but it may take time to develop the infrastructure. The need to ramp up production of both new models and batteries may act to slow growth, at least for a while and especially in the strong policy case, but do not seem likely to act as a fundamental longer term constraint. Grid constraints. EVs are likely to require reinforcement of grids, but again this does not look like a major barrier given the timescales involved. These projections show much faster growth than analysis by BNEF, which suggests 35% market share by 2045. However the reasons that BNEF sees growth being so restricted are unclear, and there appear to be few examples where the penetration of a new technology has been so slow. It seems a more likely estimate for a share of the stock by that date, though even then looks to be towards the low end of the range. Goldman Sachs estimates 22% of the market being EVs by 2025. This includes conventional hybrids, with the share of plug-in vehicles being only about a third of this, closer to the moderate case. However it would not seem to require a fundamental change to the market’s development for a greater share of hybrids to be plug-in, so Goldman’s analysis seems at least potentially consistent with the strong regulation case shown here. Other scenarios show something close to the moderate case shown here. 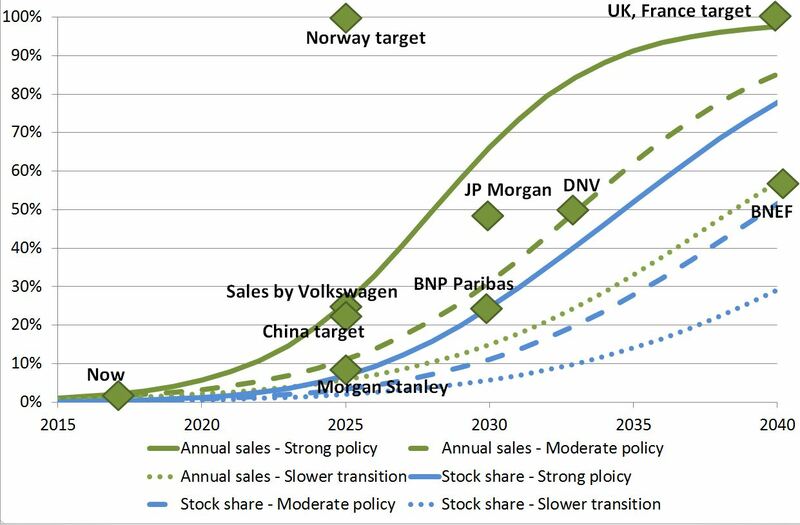 The IEA 450 scenario and Statoil’s reform scenario both show EV sales reaching around 30% of the market by 2030. Outturn will doubtless differ from these projections. But they do highlight the extent to which policy might succeed in stimulating a major transition in car markets in the next two or three decades. All estimates here refer to pure electric vehicles and plug in hybrids, which get much or all of their energy from externally generated electricity. Depending on driving patterns, a PHEV may typically get 70% of its energy from external electricity. I exclude conventional hybrids, which are essentially a variant of internal combustion engines with increased efficiency, in that still get all their energy from petrol. Some have made the case that on pure resource cost grounds internal combustion engine vehicles will continue to predominate. See http://www.energypost.eu/can-battery-electrics-disrupt-internal-combustion-engine-part-1/ This is potentially true in the absence of any policy drivers due to emissions or other factors, but this seems unrealistic. For comparison, BP assume a doubling of the vehicle fleet by 2035, about a 3.5% p.a. growth rate (see there 2035 outlook). This entry was posted in Climate change policy, electric vehicles, transport and tagged climate change policy, decarbonisation, electric vehicles, market growth, s curve, transport on 24/05/2016 by adamwhitmore. The role of biomass in the world energy system looks likely to be constrained, so there will be a need to focus on high value applications where there are few low-carbon alternatives. This is the second of two posts looking at the role of biomass. Here I focus on potential resource constraints. The amount of biomass available to provide energy depends a lot on the amount of land available to grow energy crops, and how much that land can yield. Different assumptions on these variables produce quite different estimates of the total resource, and numerous studies over the years have produced a wide range of results. 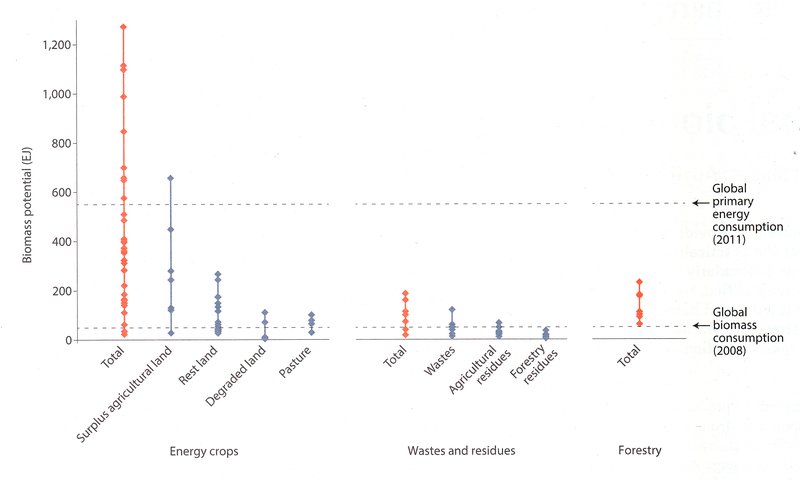 The amount of waste biomass available also matters, but potential availability from this source is smaller. A comprehensive review of estimates of the biomass resource was carried out two years ago by researchers at Imperial College[i] (see chart). It showed a variation in estimates of a factor of around 40, from of the order of 30 EJ to over 1000 EJ (1EJ =1018 J, or a billion GJ, or 278 TWh). This compares with total world primary energy demand of just under 600 EJ, transport demand of around 100 EJ, and at least 250 EJ to produce present levels of electricity, assuming biomass combustion to remain relatively inefficient[ii]. The authors examine reasons for differences in estimates, which I’ve summarised in the table below. The differences are largely assumption driven, because the small scale of commercial bioenergy at present provides little empirical evidence about the potential for very large scale bioenergy, and future developments in food demand and other factors are inevitably uncertain. Up to 100EJ Limited land available for energy crops, high demand for food, limited productivity gains in food production, and existing trends for meat consumption. Some degraded or abandoned land is available. In practice there seem to me to be grounds for caution about the scale of the available resource, although all of these propositions require testing, including through implementation of early projects. There will rightly be emphasis on protection of primary forest on both carbon management and biodiversity grounds, with some reforestation and rewilding. There is little evidence of a shift away from meat consumption. With the exception of India, less than 10% of people in most countries are vegetarian despite many years of campaigning on various grounds[iii]. In China meat consumption is associated with rising living standards. The nitrogen cycle is already beyond its limit, constraining the role of fertiliser, and water stress is a serious issue in many places (agriculture accounts for 70% of current fresh water use). The UN Food and Agriculture Organisation has projected fairly modest increases in future yields. Difficulties in limiting lifecycle emissions from biofuels are likely to lead to caution about widespread deployment. Concerns about food security may limit growth of biofuels. There has been little progress to date compared with other low carbon technologies. Though traditional biofuels remain widely used, modern biofuels account for a very small proportion of demand at present. World biofuels consumption currently accounts for only 0.2% of world oil consumption[iv] . Many biofuels programmes have had subsidies cut and there is still limited private sector investment. In this context some estimates of the potential for biomass to contribute to energy supply seem optimistic. For example, Shell’s long-term scenarios (Oceans and Mountains) show biomass of 74 EJ and 87 EJ respectively for commercial biomass, 97-133 EJ including traditional biomass by 2060[v]. These totals are towards or above the more cautious estimates for the resource that might ultimately be available (see table above). A recent review article[vi] suggested that by 2100 up to 3.3 GtCp.a. (around 12 billion tonnes of CO2) could be being removed, and producing around 170EJ of energy. However the land requirements for this are very large at about 10% of current agricultural land. The authors suggest instead a mean value for biomass potential of about a third of that, or 60EJ. On balance it seems that biomass is likely to account for at most less than 10% of commercial global energy (likely to be around 800-900EJ by mid-century), and potentially much less if land availability and difficulties with lifecycle emissions prove intractable. It thus seems likely that biomass energy will be relatively scarce, and so potentially of high value. This in turn suggests it is likely to be mainly used in applications where other low carbon alternatives are unavailable. These are not likely to be the same everywhere, but they are likely often to include transport applications, especially aviation and likely heavy trucking, and perhaps to meet seasonal heat demand in northern latitudes. For example, according to Shell’s scenarios aviation (passengers + freight) is expected to account for perhaps 20-25EJ by 2050, and biomass could likely make a useful contribution to decarbonisation in this sector. None of this implies that biomass is unimportant, or has no role to play. It does imply that policies focussing on deploying other renewable energy sources at large scale, including production of low carbon electricity for transport, will be essential to meeting decarbonisation targets. And the optimum use of biomass will require careful monitoring and management. [ii] Data on final consumption and electricity production from Shell and IEA data. 35% efficiency for biomass in electricity is assumed, which is likely to be somewhat optimistic, especially if CCS is employed. [v] http://www.shell.com/energy-and-innovation/the-energy-future/shell-scenarios.html These totals include biofuels, gasified biomass and biomass waste solids, and traditional biomass. [vi] Smith et. al., Biophysical and economic limits to negative CO2 emissions, Nature Climate Change, January 2016. The paper estimates land requirement for 170 EJ of 380-700 Mha, around 10% of total agricultural land area in 2000 of 4960Mha. This entry was posted in bioenergy, Climate change policy, power generation, renewables, transport and tagged carbon pricing, energy technology, power generation, renewables, transport on 11/04/2016 by adamwhitmore. Framing of decarbonisation pathways needs to take the value in use of low carbon technologies into account. This can provide a fuller and more positive guide to policy than analysis of marginal abatement costs alone. Much analysis of pathways for decarbonising economies takes as its starting point Marginal Abatement Costs (MACs), looking at the cost per tonne of reducing emissions. This is a useful perspective, for example highlighting the cost effectiveness of improved insulation in buildings. However, framing decarbonisation as a problem of costs incurred in reducing emissions risks ignoring other characteristics of a low carbon economy. A broader and more positive framing needs to consider how a more attractive low carbon future can be realised. This broader framing emphasises some of the potential benefits of low carbon technologies, as well as focussing on non-price barriers to adoption. Such a framing can offer a more useful guide to the range of policies needed to develop low carbon pathways. (I should also note that carrying out reliable MAC analysis can itself pose significant challenges. Some of these are reviewed at the end of this post, but here the main focus here is on those issues difficult to accommodate within the MAC framework). MAC analysis tends to assume that the reduction in emissions is the main difference between two products which are otherwise very similar (very close substitutes for each other). This is largely valid for commodities such as electricity, although even here issues such as timing and reliability of generation need to be considered. However for most consumer goods improving characteristics in use can greatly increase their value. Making low carbon products cheaper is crucial. But if they are also better than the higher carbon alternatives this will lead to much more willing and rapid adoption. Electric vehicles illustrate how non-price attributes can provide additional value to consumers and others, but can also create barriers to adoption. Electric vehicles have a number of characteristics, which, at least in my experience, make them preferable to their internal combustion engine equivalents. They are quiet and pleasant to drive, as the Nissan Leaf, the world’s best-selling electric car to date, and the more recent BMW i3 both demonstrate. Refuelling by simply plugging in overnight is convenient, and there is no need to visit petrol stations, which are not generally pleasant places to be despite the best efforts of oil companies to make them more appealing. Low centres of gravity lead to good road holding, and electric motors are instantly responsive, making for smooth and often rapid acceleration. Performance has been one of the main selling points of the Tesla S, and responsiveness is one reason electric motors are finding their way into hybrid drive trains even on high performance cars such as my local car factory’s premiere product, the astonishingly quick and vastly expensive McLaren P1. While car markets are highly competitive the variation in price for similar cars shows that consumers are often prepared to pay a premium for a car with improved characteristics. For example, variants of the Volkswagen Golf hatchback range in price from £17,000 to £26,000. Electric vehicles may similarly be able to realise premiums that reflect their benefits, with the Tesla S already the bestselling car in a third of the richest US postal codes. Wider benefits may also play a role in adoption of low carbon technologies. Local air quality is improved by the absence of emissions of particulates and other local pollutants. This has led some cities to encourage electric vehicles, with, for example, plans for all new London taxis to be zero emission by 2018. Such non-GHG benefits are produced jointly with greenhouse gas emissions reduction and will in some cases dominate the case for change. There are also non-price barriers to the use of EVs that can also affect uptake, most notably availability of recharging points to enable longer journeys. To ease these difficulties governments and the industry are expanding charging networks. However range limitations remain, along with price, the biggest obstacle to uptake for most electric vehicles. The Tesla S largely overcomes the range problem with its 300 mile range, but at over £60,000 excluding the government incentive it is not a cheap vehicle. Plug-in hybrids largely avoid the range problem by retaining an internal combustion engine or on-board generator, but with some compromises of their own. Similarly, there is much that manufacturers can do to make other low carbon products more appealing. The chart below shows the spectrum from different types of lighting. The quality of the light is very different in each case, with the light from compact fluorescents (CFLs) clearly much less continuous than from other sources. Whatever else, these are clearly not exact substitutes. It was perhaps premature for the EU to regulate incandescent electric light bulbs out of the market when many people found the light from the substitutes less appealing, and, while many may prefer them to CFLs, there may be much manufacturers can still do to improve the quality of light from LEDs, alongside continuing reductions in costs. To take one more example of non-price characteristics from among many, there is surely room for improvement in the aesthetics of rooftop solar panels, at least in some contexts, and a number of innovators are working on this. Fortunately, gauging and meeting consumer preferences is something markets do rather well, at least when consumers know what they want and can tell what has been delivered. So markets have an important role to play in decarbonisation. But it will be the behaviour of markets for low carbon products as well as markets carbon such as the EUETS that will be crucial to successful decarbonisation. Decarbonising an economy is difficult and complex. It can be made easier if new technologies not only have lower carbon dioxide emission than the alternatives, but are also better in other respects. Policy can help promote this by stimulating innovation, enabling early adoption and removing barriers. If the future not only has a safer, more stable climate, but is also brighter, cleaner, better looking, and more fun to drive around it will be a lot easier to persuade people that it’s a future in which they wish to invest. MAC analysis is further limited by difficulties of application in practice. Several factors complicate estimates of the cost of abatement, and some of these are illustrated here by reference to electric vehicles. These factors can be, and sometimes are, taken into account in careful analysis of abatement costs. However they are difficult to treat properly, because of the scope of the modelling frameworks and the amount of information they require make them very demanding to assess. First, the quantity of emissions avoided, and thus cost of abatement, is very dependent on the emissions intensity of the source of electricity. For example, Norway, currently the world leader in the deployment of EVs, has a mainly hydro based grid, leading to relatively large emissions reductions. However emissions from electricity generation will be greater in countries with fossil based systems, which will lead to a lower reduction in emissions and higher abatement costs, other things being equal. However just how much lower may depend on factors such as when EVs are charged, and what the marginal generating plant on the system is at that time. Furthermore, lifecycle emissions of the vehicle itself can vary greatly between EV models and even between the same model made with materials from different sources. For example, the emissions from smelting aluminium for a lightweight body can be very different depending the source of the electricity used in smelting, and emissions will be different again in making a carbon fibre body such as that used for the BMW i3 and i8. An additional complication is that many lifecycle emissions can fall outside the jurisdiction being assessed, and may be covered by a quite different set of policies. Costs can also change greatly over time, sometimes to an unanticipated extent. Batteries account for a large proportion of the cost of an EV, but costs are falling rapidly. In the last five years costs have more than halved and energy densities, which set the size of battery pack, have more than doubled. This trend seems likely to continue as a result of continuing R&D and increasing deployment. Technology spill-over benefits from early deployment are difficult to account for in a MAC analysis. They are among the reasons EVs currently attract financial incentives in many jurisdictions, for example a £5000 grant in the UK, $7500 Federal Tax Credit in the USA, and exemption from VAT and purchase tax in Norway. Other incentives can also play a role in stimulating early adoption, including exempting EVs from tolls or congestion charges, allowing EVs on High Occupancy or bus lanes, providing free parking, and mandating tight emission standards. On battery costs: US DoE report published as part of their EV programme shows costs for batteries declining to around $300-350/kWh. For a comparison changing the specification of a Tesla S from a 60kWh battery to an 85kWh battery (the two models are otherwise quite similar) increases the price by £6170 excluding VAT, which is $400/kWh (see here). This entry was posted in Climate change policy, transport and tagged marginal abatement costs on 28/02/2014 by adamwhitmore. Taxes on petrol can be the equivalent of nearly $500/tonne. The UK’s annual tax on cars can bring the total up to over $700/tonne with typical mileage. This is around two orders of magnitude greater than the carbon price that other sectors face at the moment under the EUETS, and one indicator of the challenges involved in decarbonising road transport. With the UK budget due next week there is, as usual, debate about whether planned increases in petrol taxes should be abandoned. Although emissions from cars are not subject to a carbon price under the EUETS at the moment, existing taxes put an effective price on emissions – the more petrol a car burns the greater the emissions and the greater the tax paid. There is a price signal to reduce fuel burnt, and hence CO2 emissions (although fuel duty is not labelled a carbon tax, and may, of course, also price other externalities associated with burning petrol or diesel). Looking at this price signal gives important insights into how the transport sector would be likely to react to an explicit carbon price, and says much about whether proposed increases in fuel duty can be justified on the grounds of incentivising reductions in CO2 emissions. VAT charged on the excise tax is included, but that on the petrol is not, as this is not a tax specific to petrol. Emissions factor assumed is 2.3 kgCO2e/litre. Federal and state taxes are included in California, no sales tax is included. This calculation excludes the effect of UK Vehicle Excise Duty (VED), sometimes called road tax. This annual charge per vehicle depends on the vehicle’s emissions of CO2 per km. Although it does not vary with actual emissions, which depend on distance travelled and other factors such as traffic conditions, it nevertheless makes vehicles with higher carbon emissions more expensive to own on an annual basis. Increasing vehicle emissions from just over 100g/km to just over 200g/km adds £250 p.a. of VED to the annual cost of a vehicle. Assuming the vehicle clocks up 16,000 km (around 10,000 miles) per year, and emissions per km are at the standardised level used to set VED, the additional emissions are 1.6 tonnes p.a., so the change in VED adds another £156/tonne ($238/tonne) to the effective carbon price, to give a total effective price of over $700/tonne (see chart). This figure is lower for those who travel more, higher for those who travel less than the 16,000km p.a. assumed, but it’s a large number for any typical car owner, and leads to a total effective carbon price about a 100 times greater than the current carbon price under the EUETS. There are additional policy measures to encourage lower emissions vehicles in place in the UK designed. Vehicles’ CO2 emissions are clearly labelled in advertisements for cars. EU regulation sets limits to average fleet emissions over time. Electric vehicles receive a subsidy to encourage their uptake, and there are efforts to create a grid of charging points. Yet people still choose to drive conventional internal combustion engine cars. A carbon price of several hundred dollars per tonne is not enough to reduce emissions from cars to anywhere near zero with present technologies. People have a high willingness to pay for personal mobility and the alternatives to internal combustion engine cars are not available at the price and travelling range that would lead people to switch. Furthermore, despite high oil prices as well as high taxes, many people continue to drive cars with much higher emissions than others on the market. People place a high value on many of the features that go with additional emissions, whether it’s better acceleration, increased size, or greater social prestige. Continuing innovation will be needed from the world’s car makers if the transport sector is to be decarbonised, even with an effective carbon price vastly greater than that currently found in emissions trading schemes. And whatever justifications there may be for increases in petrol duty in the forthcoming budget, creating a carbon price signal comparable with that prevailing in other sectors is certainly not one of them. This entry was posted in carbon pricing, transport and tagged carbon pricing, carbon taxes, climate change, climate change policy on 15/03/2013 by adamwhitmore.